The first ingredient in Canis soup is the charismatic North American gray wolf or timber wolf, Canis lupus, sometimes known as Canis lupus lupus to differentiate him from the dog and the dingo, who belong to subspecies. The gray wolf is the largest wild canine, at a 79 pound (36 kg) average weight. (Domestic dogs of some breeds, of course, weigh more than that.) His coat coloring can vary from white through blond, brown, grey, and black. He is found in the western parts of North America. Next is the Western coyote, Canis latrans. 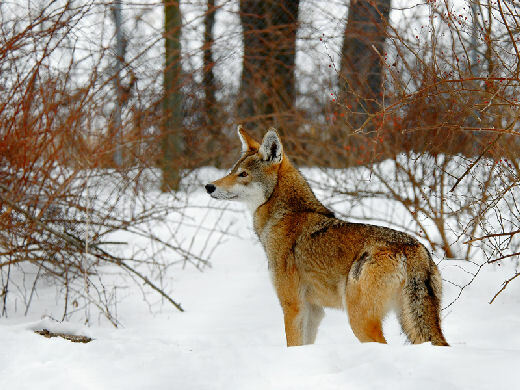 This animal is also known as the American jackal or prairie wolf, suggesting that there has been some confusion about how to distinguish canine species for some time. The Western coyote is a significantly smaller animal than the gray wolf, weighing in closer to 20 pounds (7-14 kg). His coat color is less varied than the gray wolf’s, almost always a grey-brown as you see in the image here. The range of the Eastern wolf or Algonquin wolf, Canis lycaon, is Ontario, Canada. 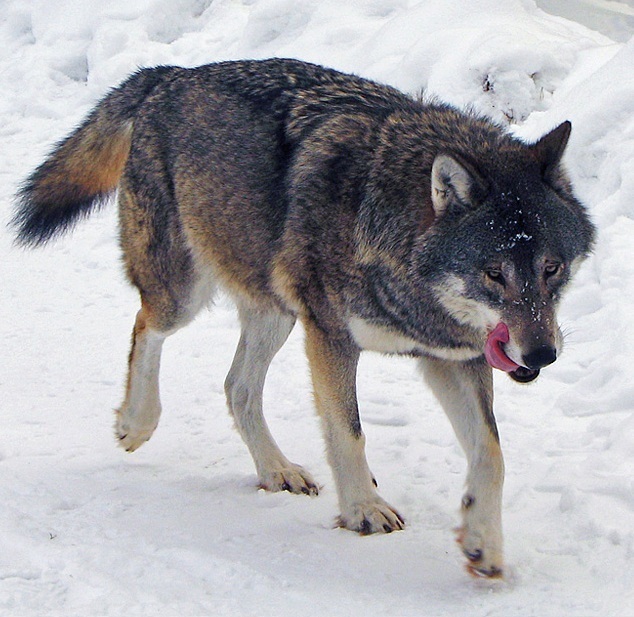 This wolf is smaller than the gray wolf, and has a distinctive grey-red coat with black hairs along his back. We believe that this wolf was the original North American canine, and that Canis lupus and Canis latrans immigrated over the land bridge from Europe. There’s a lot of debate about the species status of C. lycaon, as many Eastern wolves appear to have significant C. latrans heritage. Some people suggest that the Eastern wolf is in fact a C. lupus/C. latrans hybrid, or, alternately, a subspecies of the gray wolf, C. lupus lycaon. The Eastern coyote, spreading along the east coast of the United States, is significantly larger than his Western counterpart. He turns out to be a coyote/wolf hybrid, and it has been argued that he should more accurately be called a coywolf. His wolf ancestors seem to be Canis lycaon — but then again, there is debate about whether C. lycaon is really different from C. lupus at all. The red wolf or Southeastern wolf is subject to truly intense debate about species status. Is he his own species, Canis rufus? A subset of the gray wolf, Canis lupus rufus? Or a population of Eastern wolf, Canis lycaon? He has a beautiful red coat, and is smaller in size than the gray wolf. His range was historically the southeastern U.S., but he went extinct in the wild by 1980. A founder population of 19 animals survived in captivity, and a reintroduction project in North Carolina was begun in 1987. Here the red wolf is today enthusiastically interbreeding with coyotes, leaving conservationists to wonder what they are conserving. Wild canine populations challenge us to let go of our obsessive need to categorize. Instead of slotting a canine population into a single species category, we might instead think of it as existing on a spectrum from “wolf-like” to “coyote-like.” A strongly wolf-like canid would be larger, sixty to ninety pounds. He would require a larger range, and would be a deerivore, subsisting off of larger game. He is likely to be a shyer animal, found only in more rural or wild areas. Conversely, a strongly coyote-like canid would be much smaller, fifteen to thirty pounds, with a smaller range. He might eat deer as well as rabbits and et cetera (probably a lot of et cetera, as coyotes are more willing to scrounge than wolves are). He would be more likely to be found in suburban areas, with a greater tolerance for human proximity. A given population of canines might fall anywhere on the spectrum between the two. The fact that a spectrum actually exists is beautifully demonstrated by the Eastern coyote, who has mixed coyote/wolf ancestry, is mid-sized between coyote and wolf, and has a mid-sized range. It is, of course, possible to think about the problem without asking for genetics to provide the complete answer for us. The red wolf is a red wolf, a beautiful, iconic animal that has lived in the southeastern United States throughout living memory. We know what the red wolf looks like (and that hasn’t been changing much, no matter what is happening to his genes). We also know that he is important in a particular environmental niche, and that hasn’t been changing much either. As a culture, I hope we can come to appreciate the strengths that the coyote brings to Canis soup, in his ability to coexist with humans in the modern world. He may be what saves populations of charismatic wolves from permanent loss. As we look at populations of canines in North America, we should learn to say that one is more coyote-like and another more wolf-like, on a spectrum from one flavor of soup to another, and appreciate the benefits of both. I recently finished Control Unleashed: Creating a focused and confident dog, by Leslie McDevitt. This book is designed for people training dogs in agility who are having issues with their dogs’ ability to focus, so you might imagine that the book isn’t useful to people with fearful dogs like mine. But it turns out, unsurprisingly, that if your dog is having issues focusing, he may well actually be nervous about something in his environment, such as strange people or other dogs. This book is full of exercises for helping your dog be more comfortable and relaxed, whatever his reason for being distractable. It was incredibly helpful to me in thinking through exercises for my shy dog Jenny, to help her learn to trust the world a little more. Even if you don’t do agility with your dog, this book may be helpful in making you a better trainer. It includes many examples of specific training exercises to try, and stories about situations in which they were particularly helpful. It was also an enjoyable enough read that I got through it while working long hours on some difficult rotations — I looked forward to finding ten minutes to read it before bed. I recommend this book to everyone who has has basic understanding of positive training and learning theory, and wants to learn more. In vet school, you get a little inured to gross things. I cut up mice for raptors every day on this rotation without getting squeamish. But I found peeling the skin off of two day old mice (thankfully already dead) to be a bit much. The intern was a little bewildered by my reaction. Anyways, it didn’t work. The next day I went to a different vet for advice. “Sometimes,” she said, “they like to have the mice split open and the liver displayed... You can leave the skin on.” I did this. I was artistic about it. HERE ARE THE LIVERS. PLEASE EAT THEM. And that night, she ate. My next problem patients were two barred owls who had recently been transported a fairly long distance, which we were examining before they were placed into permanent captivity, as they were not releasable. These guys really didn't want to eat. I laid the mice out enticingly next to a branch on the ground. I split them open and DISPLAYED THE LIVERS. No. The intern said, “They don’t want to come off their perch. They’re scared. Put the mice on the perch.” Easier said than done (he said it, I did it). One of the owls inevitably reacted to my entry into the pen with OH HOLY CRAP I AM GOING TO DIE, flying back and forth at high speeds. It wasn’t a very big pen. I covered my head with my arms and crept at a snail’s pace towards the perch. Veeeeery slowly I balanced the mice on the perch. And crept away again. That night, the owls ate. The next day, as I was artistically displaying peeled mouse haunch for an Eastern box turtle (the mealworms weren’t working as they would just escape into his cage and set up shop there) I thought to myself: how did this become my life?